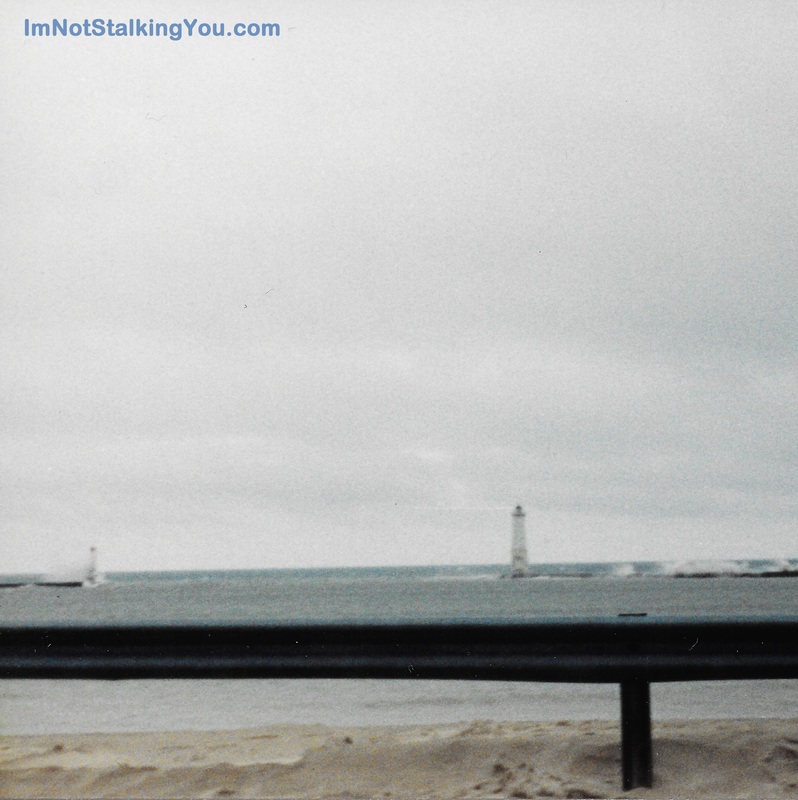 road | I'm not stalking you. 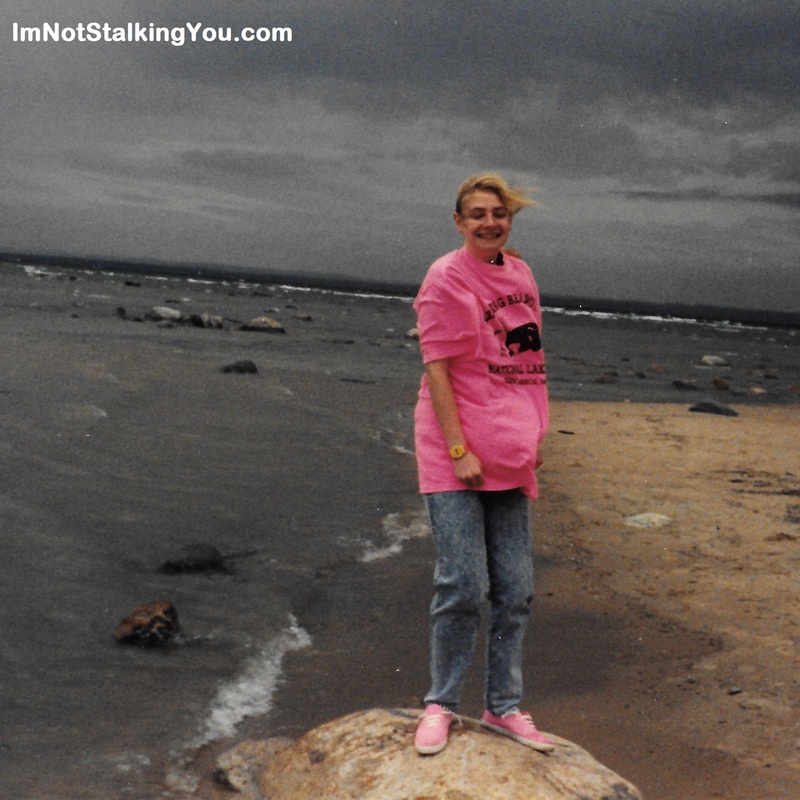 My mom and I took a vacation “Up North” in Michigan in June of 1990. I had completed 8th grade, and was due to change buildings to start scary high school in the fall. My 80’s perm that I had finally gotten caused my hair to become dry and frizzy, and I didn’t have the good sense yet to cut it of. My hair would never be as long again until my future wedding. I still toted my New Kids on The Block book with me, and of course my stuffed animal Barfeys. We were only going for three days. My mom decided we would travel up the west side of the state. This was a change from trips we had taken Up North in the past. Usually we were gone for four days, to allow for more sight-seeing, and we usually traveled up the east side or the middle of the state. This was my mom’s statement, over and over again, as we planned out the trip. Mackinaw City, and with it the Mackinaw Bridge, are two of my mom’s favorite things in the world. We had been there before. But I think she made the statement for two reasons. I think she wanted to see something new we had not seen before, which is why we went up the west side of the state. How she travels, then this took longer, and I don’t think she had enough money for us to have another night’s motel stay. And she did not want to drive all the way home from Mackinaw City in one day. Wait. That is three reasons. But they are all related to each other. We headed off at the end of June. My mom must have thought I was old enough to pack for myself, because I went without a jacket. It is summer! It is June! Who needs a jacket! That was the gloomiest, rainiest, coldest end of June, until 2015. Since then, I have learned that it is always colder the further north you go, and near the water. Either way, it was still colder than it should have been. My mom told me to layer my T-shirts, so I did. It did not really help to keep me any warmer. Our first major stop was Holland, Michigan. It was really awesome to see an actual Dutch windmill. There were dancers who wore wooden shoes. They were impressive. Even with wearing layers and layers of socks, I still figured that must be the worst summer job in town. 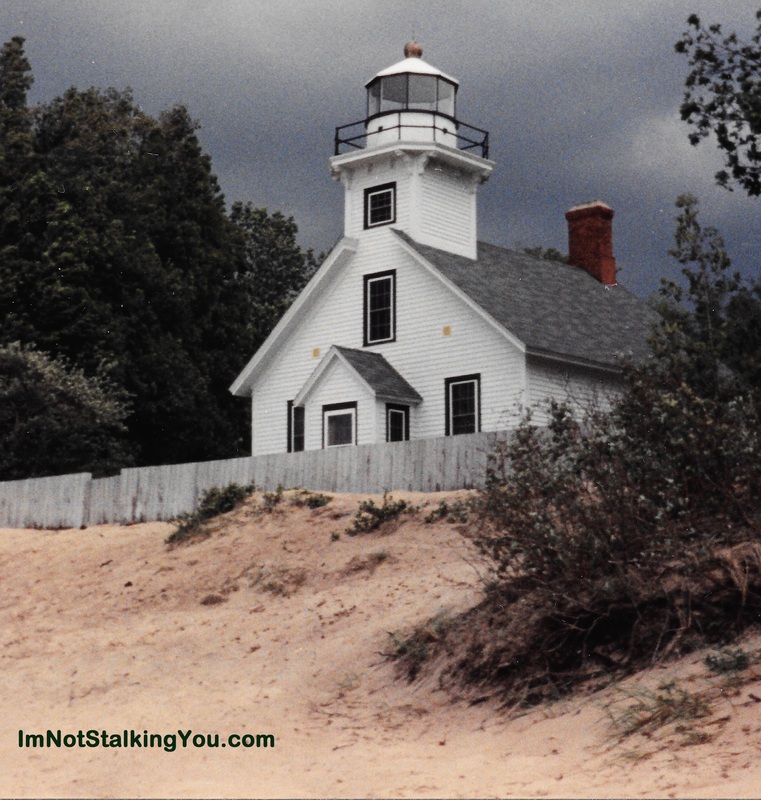 We traveled through Muskegon that day, and spent the night in Manistee. I kept thinking how much it sounded like “manatee.” We went to sleep and dreamed of warm days and sunny skies. But the dawn brought only more clouds and rain. We traveled through Frankfort and spotted a lighthouse across the water. Lighthouses are my favorite. If I recall correctly, my mom found a condo parking lot she drove through to get a better look at it. The Frankfort light may have been the first one I ever saw with a breakwater attached to it. The way the rough waters splashed up against it was impressive. I could have captured it better with a digital camera, but they did not exist yet. We stopped at Sleeping Bear Dunes, another of my favorite places. Not so much when it is blowing and cold and rainy though. The first time we had ever been there, I was like eight years old. My mom wasn’t spry enough to climb the dunes with me, and I was too young to climb them by myself. Now, I was old enough to go up myself, but the weather was just too crappy. We bought me a souvenir T-shirt in the gift shop, to add to my layers of warmth. 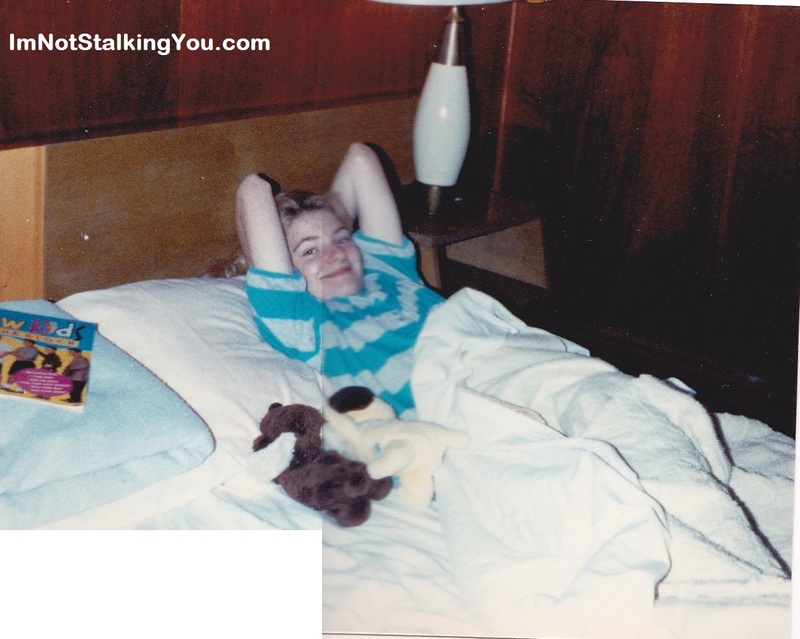 (I was wearing all the shirts I had brought for the entire vacation every day.) It was neon pink and three sizes too big, because I was not done with 80’s fashions yet. We went to Traverse City. We drove out on Old Mission Point and found another lighthouse. We couldn’t go inside or climb this one either, but at least we could take pictures out front. My mom got on the road to Mackinaw City (Route 31, most likely). We passed through little towns. We passed by convenience stores selling fudge. We passed through the big cities of Charlevoix and Petoskey. She kept driving. I kept quiet. Sure, I was the navigator with the map, but she had to know we were headed for Mackinaw City, right? After all, there were road signs that indicated we were nearing it. Billboards advertising the various ferry companies, Arnold, Sheplers, and Star Line, became more and more prominent. Another funny thing happened. The clouds began to clear. Had she lost her mind? Taken leave of her senses? 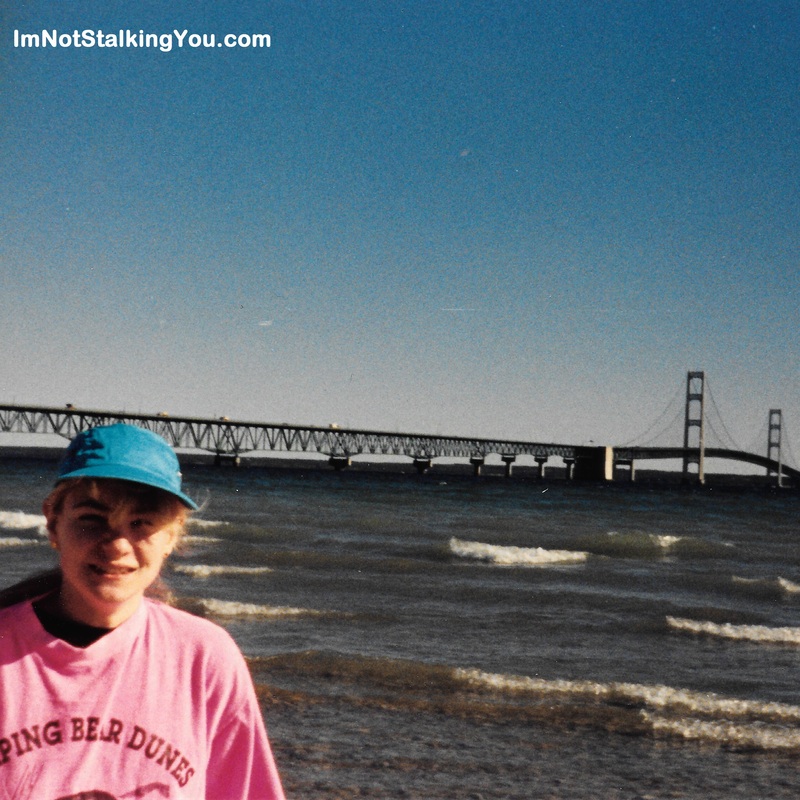 Either way, I was keeping my mouth shut, because I really really DID want to go to Mackinaw City. I figured if I didn’t say anything, we would just end up there and it would be too late. And that is just what happened. We rolled into Mackinaw City. And while I wouldn’t say the sun came out, the rain stopped. The weather improved enough that the kite store was flying a long string of colorful kites up into the sky, all tied to one another. It was like a fabric rainbow after the rain. The scent of fresh fudge hung heavy in the air. Next to the Straits of Mackinac in the park at the end of the street, a huge band started to set up. When they began to play, the music drifted down the street, where cars were parked along the center boulevard as they probably had since the 1950’s, and souvenir shops lined up next to each other. 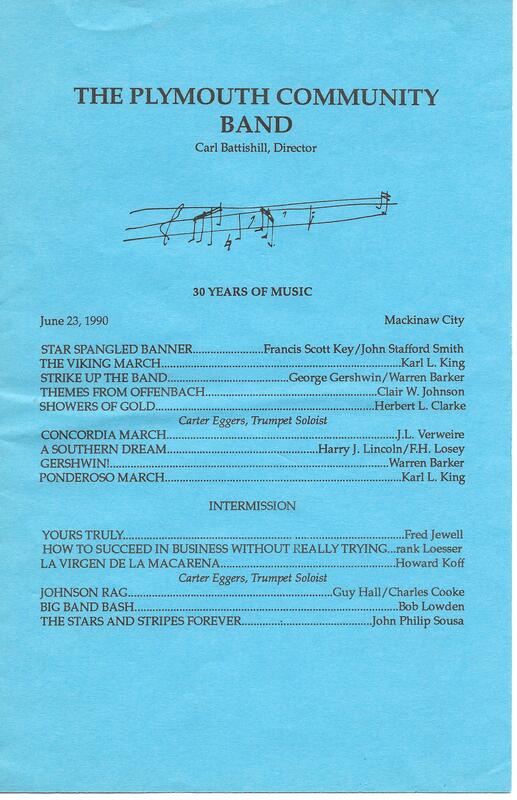 Since the 4th of July was only a few weeks away, they had many patriotic songs mixed into their selections. I guess it made sense that they were playing in the town square, since it was a Saturday evening. But I was on vacation, and had lost all track of time. I just think back on that night so fondly. It is one of the moments in my life that I will cherish forever. That may be one of the most relaxed and happy times of my life, right then. My mom and I walked the shops until the lights shined brightly inside and the sun fell below the horizon, in the shadow of the giant bridge, connecting the the two peninsulas like a neck connects a head to a body. In the morning, the sun shone brightly in the sky (of course!). We made one last visit to my mom’s favorite park by the bridge, then started off on our long trip home. Posted in Childhood Reminiscing and tagged Frankfort, fudge, Holland, lighthouse, Mackinaw City, Manistee, Michigan, Old Mission Point, Plymouth Community Band, pure, road, Sleeping Bear Dunes, tourism, Traverse City, trip, Up North. Bookmark the permalink. I live in a small town in Southeastern Michigan called Adrian. While it is small by New York, Chicago, Detroit standards, approximately 44,600 people live here and it is the county seat. So then, you would think, when they make major road construction plans that they would make sure there is still a way in and out of the city that isn’t blocked. 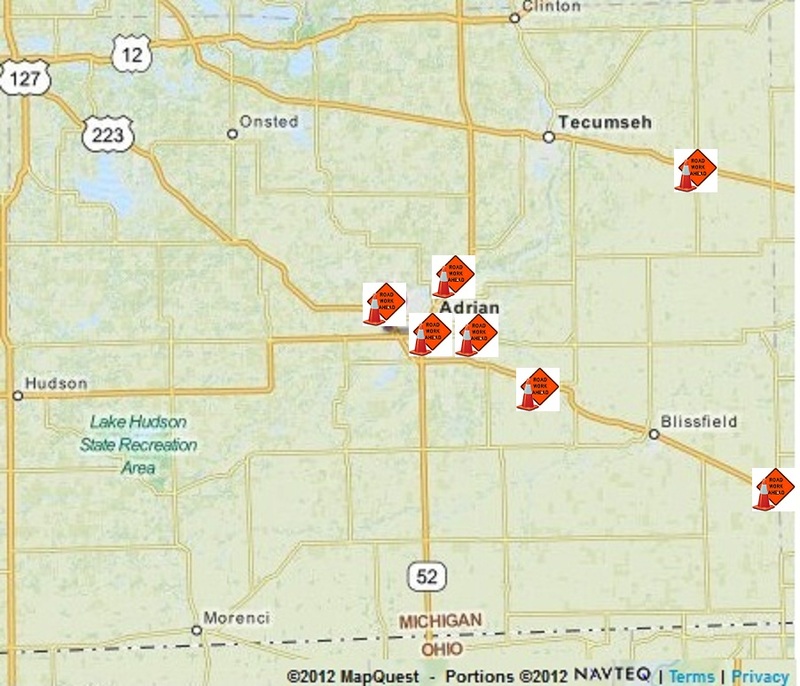 A map of Adrian showing the construction projects of 2012, as compiled by me. Think again. Great government minds at work. You also have to realize that there are small towns around Adrian that have no Walmart, Meijer, Lowes, or Spotted Cows. Hence, people come from far and wide (Blissfield, Riga, Deerfield, Palmyra) to go to Adrian (when they don’t feel like driving to Toledo or Ann Arbor). Now, to get to Adrian from the East, you have to cross the River Raisin. The River Raisin is no ordinary river. Ripley’s Believe It or Not deemed it the most crooked river in the world. (Or so they tell students in the local high school science classes.) There are a limited number of bridges to cross the River Raisin from the East. (This is really inconvenient when the river floods and closes several of them.) The main crossing between Blissfield and Adrian and the most convenient is in Palmyra. Which is now a one lane bridge due to construction. It has been since, like, April. No end in the forseeable future. My brother-in-law even contacted the Michigan Department of Transportation via Facebook to ask if they would be finished soon. They only answered that they were on schedule. And that means our grandchildren will have a new bridge? 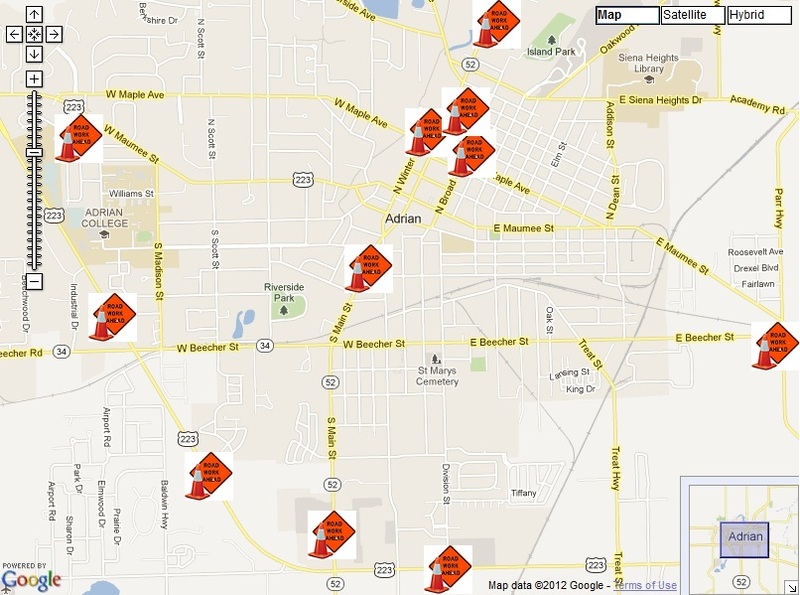 A map of Lenawee County showing all the 2012 construction projects, that I gathered myself. Many locals take a road north of the Palmyra bridge construction to get into Adrian. Or they did. Until they started resurfacing that road, going so far as to close it completely some days. This leaves only a southern detour to get to Blissfield, even involving a stretch of gravel road. My asbestos friend, in utter frustration trying to reach the grocery store recently, texted me that Adrian must be quarantined, because it was almost impossible to get to it. I laughed very hard and realized she was totally right. My husband doesn’t get it. This summer’s construction has been really miserable and it isn’t anywhere near over as they begin new projects every day. IN OCTOBER!!!!! We have 2 seasons in Michigan–Winter and Construction. Winter is here. It is time for Construction to END! Posted in A day in the life and tagged Adrian, apocalypse, Blissfield, bridge, closed, construction, Deerfield, Department of Transportation, Facebook, funny, humor, Lenawee County, Michigan, one lane, Palmyra, quarantine, Riga, road, Spotted Cow, work, zombies. Bookmark the permalink.